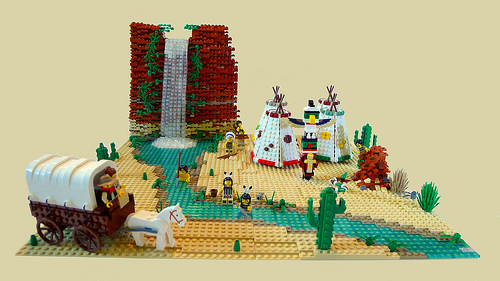 While there has been a decent number of western themed creations, few depict the lifestyle of the American Indian. This creation by Cecilie does that and features interesting techniques, most noticeably the texture of the cliff. I also like the use of the mummy wings on the totem pole – a perfect fit. Watch out for that giant rattlesnake! Pure fantasy. Totem poles were used exclusively by the peoples of the Pacific Northwest, and were typically made of cedar. These appear from the landscaping to be from some Southwestern tribe. Great modelling, though.